And in what felt like the blink of an eye, I was immediately taken back to those summer afternoons when I would spend the day at my Memaw’s house as a kid. I can so clearly recall peeking into her pantry to see what was new, and rummaging through her candy dish in the kitchen while she was in the other room watching her favorite soap opera. The moment my teeth sank into those M&M’S® Caramel candies for the first time at my in-law’s house, it was like I was like I was sitting with my Memaw again. 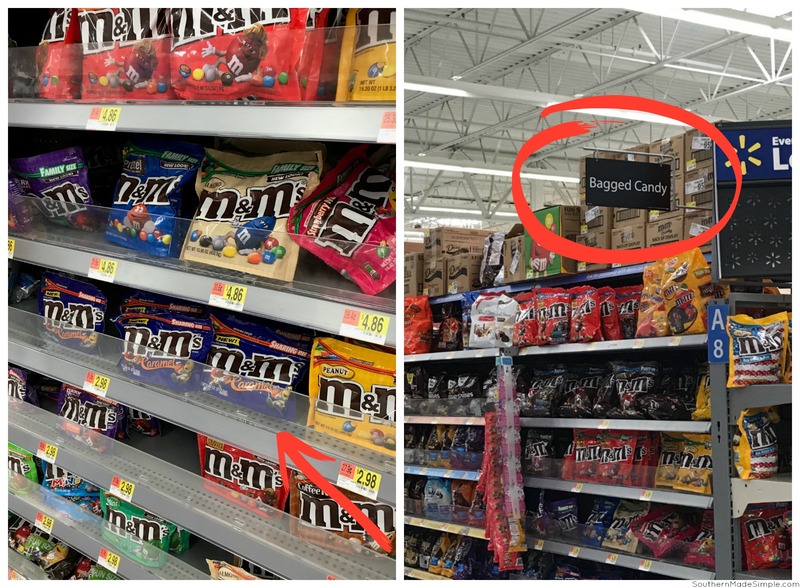 Up until that point, I had no idea that M&M’S® Caramel candies existed – but make no mistake, they were in my shopping cart (available at Walmart) the very next day! I’m not sure how they were able to manage such caramel-y perfection inside those crispy little chocolate shells, but they absolutely hit the nail on the head! Come to find out, the process actually took years to perfect. 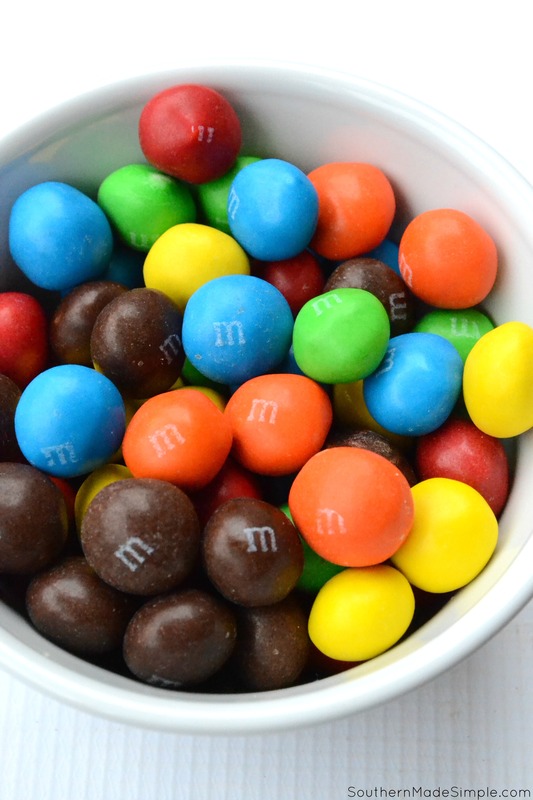 The “lentil” inside each M&M’S® Caramel candy has never before been filled with such a soft center, so engineers had to figure out how to keep the chocolate at the right consistency so it wouldn’t melt or collapse. I’m so glad those candy geniuses exist in this world! Luckily, M&M’S® Caramel candies are a permanent addition to the M&M’S® line, so I can enjoy these sweet moments forever! 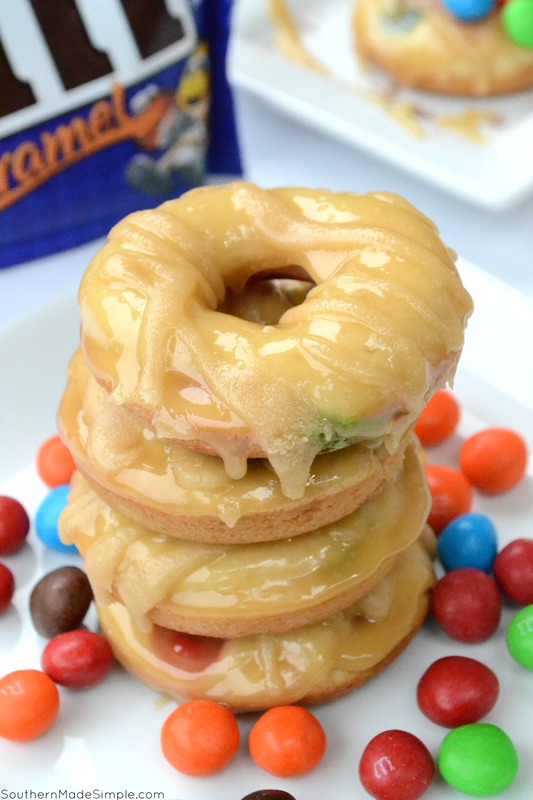 I started brainstorming ways that I could un-square caramel and use M&M’S® Caramel candies in a fun new way that would hopefully create fun memories for my family for years to come. 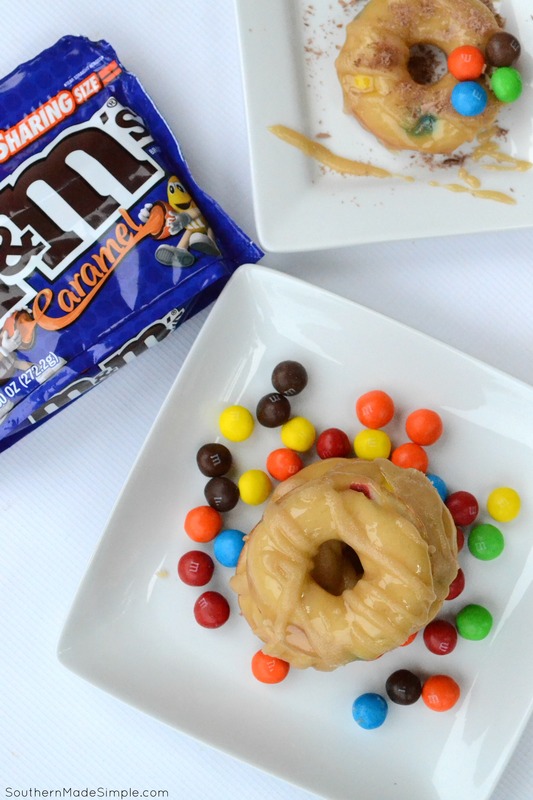 Thus, the idea for these Triple Caramel Candy Doughnuts was born! 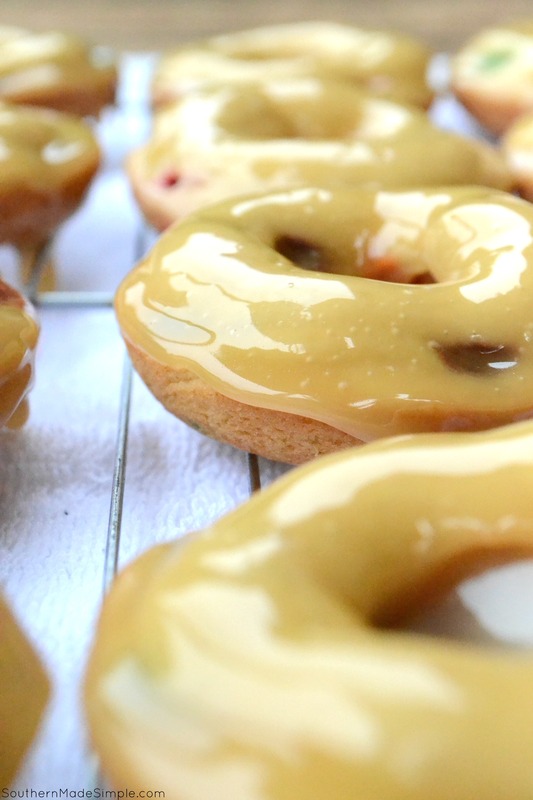 I grabbed my doughnut pans and went to work creating a creamy caramel batter. First, I took a dab of butter and generously greased the inside of each doughnut ring to prevent any sticking from happening when baking. After combining the ingredients to make the batter (you can find the full recipe listed below,) I poured the batter into a piping bag and squeezed one layer into the bottom of each doughnut round. 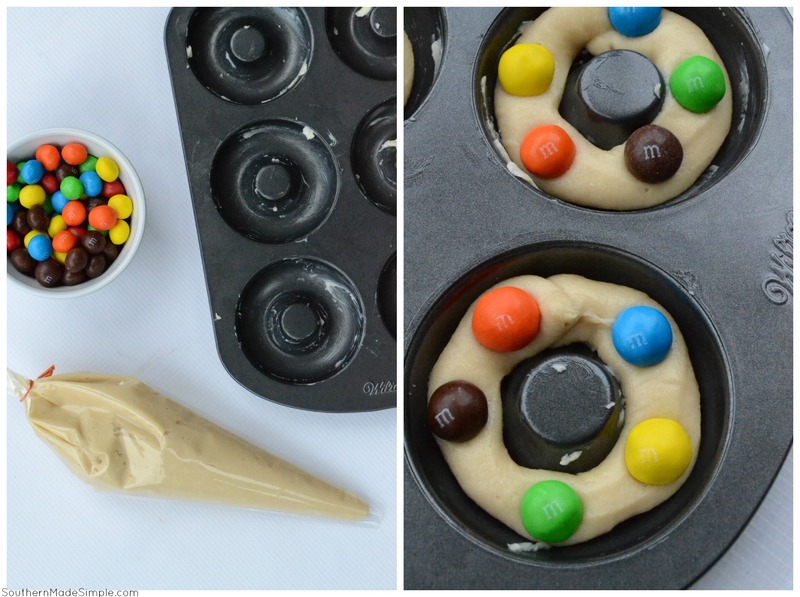 I placed 4 or 5 M&M’S® Caramel candies into the batter and piped one more layer of batter on top. I baked the doughnuts at 350 F for 15 minutes. Once I removed them from the oven, I allowed them to cool completely before coating with caramel glaze. Here’s a free printable version of my recipe if you’d like to give it a try! For me, the glaze on these doughnuts is what really makes them over-the-top delicious. This is my go-to caramel recipe that can be used for anything, and it’s so easy to make! 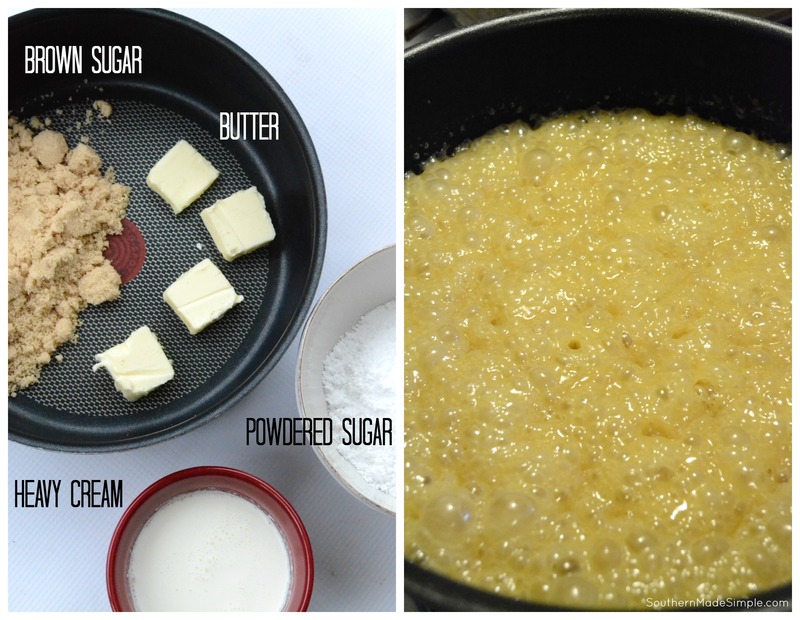 First, you’ll take 4 Tbs of butter and melt it in a sauce pan along with 1 cup of brown sugar. Next, add in the cream and vanilla and bring to a boil. Allow to boil for about 3 minutes, constantly stirring to prevent any scorching. Remove from heat and add in 1 cup of powdered sugar. Stir until well combined. While the glaze is still hot, dip the top half of each doughnut into the glaze using a pair of tongs. Place each freshly glazed doughnut onto a cooling rack with a towel or parchment paper underneath to catch the drippings. The glaze will slightly harden after sitting for about 10-15 minutes. 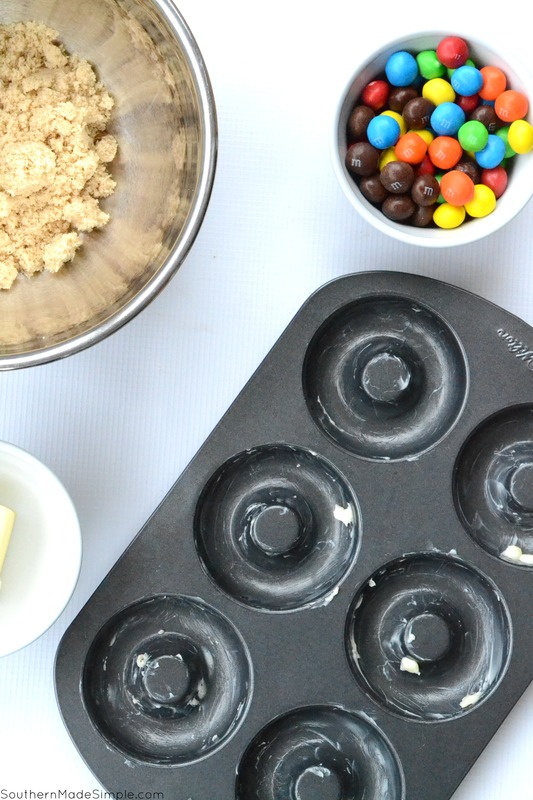 While the glaze is drying, add a few M&M’S® Caramel candies on top to decorate! I also added a little bit of shaved chocolate for extra garnish. While some doughnuts are really light and airy, these particular doughnuts are slightly more dense. 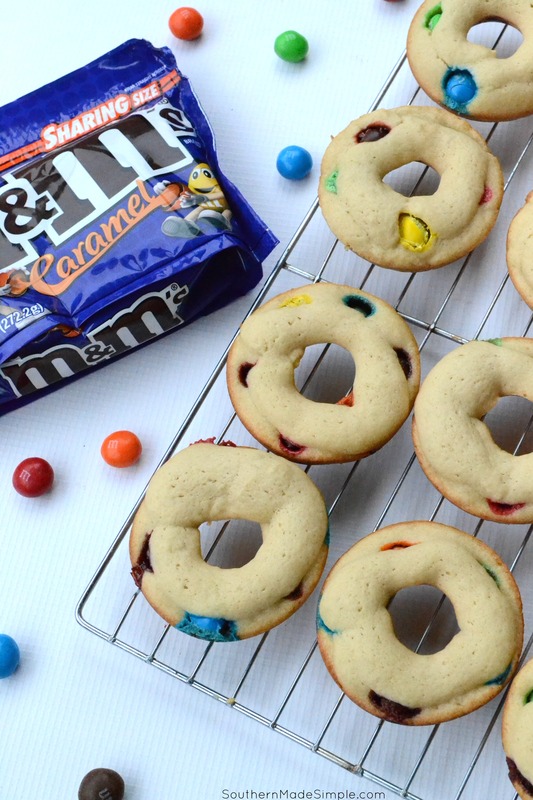 They’re perfectly rich and cake-like, and the added chewiness from the M&M’S® Caramel candies makes them a deliciously decadent treat that’s perfect for any occasion! 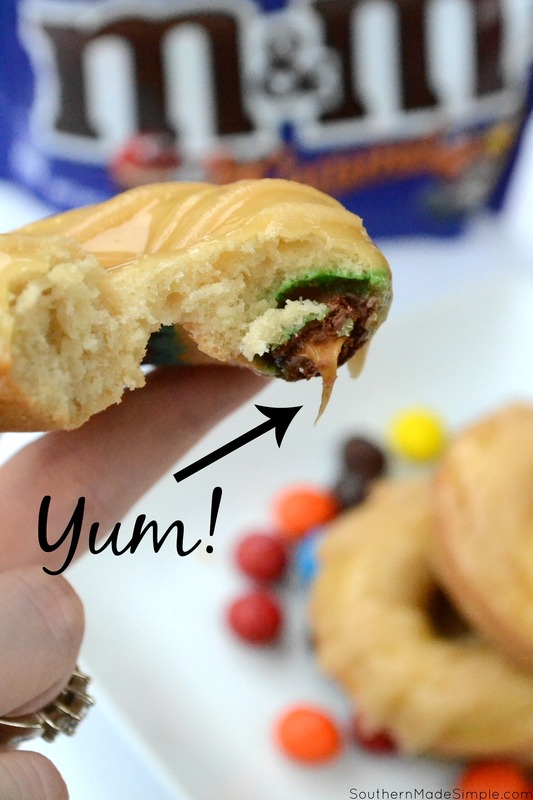 Biting directly into the creamy caramel center of the M&M’S® Caramel and watching that golden strand of caramel ooze out is enough to make these doughnuts become a treasured memory in my mind for years to come! Do you have a special memory that is often triggered by a favorite food? Are you a caramel loving foodie who is looking for a fun new way to un-square caramel? Next time you’re at Walmart, make sure you swing by the candy aisle and pick up a bag of M&M’S® Caramel candies to share with your friends and family! 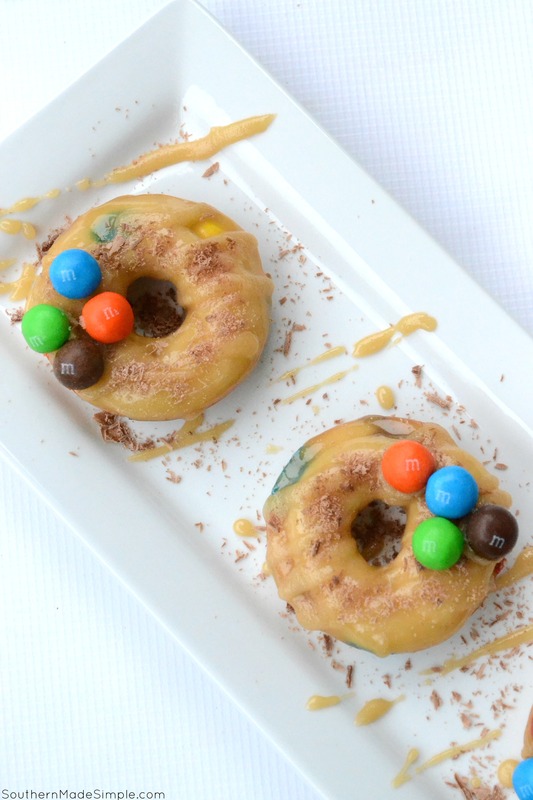 Click here for more recipe inspiration using M&M’S® Caramel candies! Previous Post: « Enjoying the Sweet Life (Guilt Free) with Sejoyia Coco-Roons!